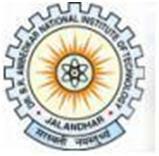 TBI Manager Vacancy – Last Date 25 March 2019 (Jalandhar, Punjab), National Institute of Technology Jalandhar (NIT Jalandhar) recruits TBI Manager Posts. Candidates with Graduate, Post Graduate experienced can apply. Bachelor’s/Master’s degree from Government recognized Board/University with 3-4 years of related experience or, an equivalent combination of education and experience sufficient to successfully perform the essential duties of the job such as those listed above. The Dr. B. R. Ambedkar National Institute of Technology Jalandhar, popularly known as NIT Jalandhar (NITJ), is a public engineering institute located in Jalandhar, Punjab, India. It is one of the 31 National Institutes of Technology of India. It was founded as a joint venture between the governments of Punjab and India, originally under the name Punjab Regional Engineering College, Jalandhar (PREC). Dr. B R Ambedkar National Institute of Technology was established in 1987 as a Regional Engineering College and was given the status of National Institute of Technology (Deemed University) by the Government of India on October 17, 2002, under the aegis of Ministry of Human Resource Development, New Delhi. Subsequently, the Ministry of Human Resource Development, Government of India, declared the Institute as “Institute of National Importance” under the act of Parliament-2007.